The State Department has granted approval for U.S. companies to market technology offerings to a Taiwanese submarine construction project, Reuters reported Monday. Reuters cites Taiwan’s Central News Agency that says defense ministry spokesperson Chen Chung-chi confirmed the marketing license issuance by DOS. 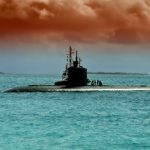 Defense News reported Liao Yen-fan, a Taipei-based defense analyst told the publication in an interview that the authorization includes the sale of a submarine combat management system and a separate technical assistance agreement. In June 2017, DOS approved Taiwan’s request to procure missiles, torpedoes, related equipment and support services through seven foreign military deals worth a combined $1.36 billion.